Research background: The crisis periods have highlighted the interdependence between individual European economies in the area of economic and fiscal development. The common development tendencies raise the question whether the fiscal indebtedness and preferred fiscal policy of V4 countries can be considered as interdepending. Considering this assumption, a possibility for implementing a similar type of consolidation in selected clusters of countries could be proposed. 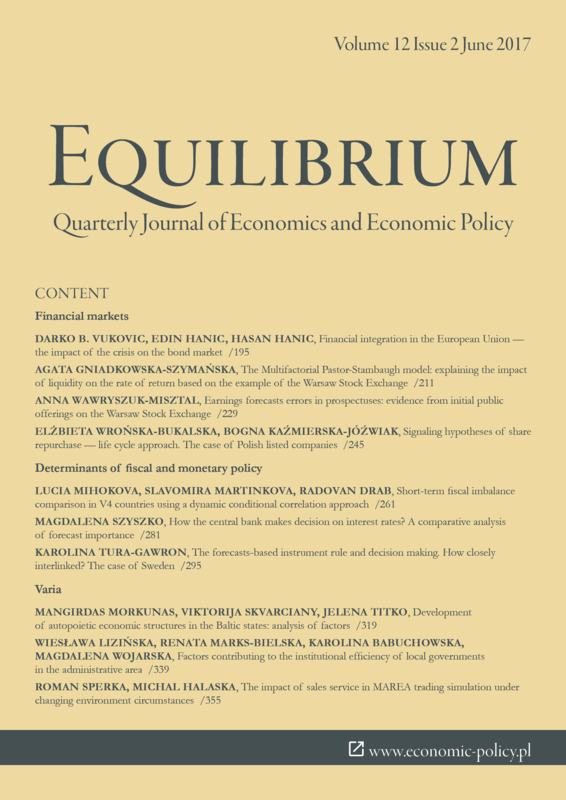 Purpose of the article: The research is, from the empirical point of view, focused on the analysis and comparison of primary balance indicator, analysis and assessment of fiscal measures (in identified fiscal episodes) and analysis of fiscal development intercorrelations using the dynamic conditional correlation approach. Methods: The empirical assessment of the research objective is, from the methodological point of view, divided into five phases: (1) the calculation of primary deficit indicator, (2) the analysis, comparison and assessment of the fiscal development in the V4 countries based on the annual primary deficit during the selected period 1999–2016, (3) the seasonal adjustment of performing time series and non-stationarity testing, (4) the dynamic conditional correlation approach (DCC) application. Within the analysis, the traditional and specific methods were used (time series analysis, content analysis, descriptive statistics, correlation methods, DCC approach). Findings & Value added: The results of the research suggest that between V4 countries do exist significant differences based on which cannot be clearly confirmed the assumption about the fiscal development interdependence in V4 countries. From the long-term perspective, it can be stated that the fiscal development in V4 countries is a very slightly positively related aspect, but in the context of the implementation of a common consolidation strategy it is not sufficient. Afonso, A., & Jalles, J. T. (2016). Fiscal episodes and market power. Open Economies Review, 28(2). doi: 10.1007/s11079-016-9419-7. Alesina, A., & Ardagna, S. (2010). Large changes in fiscal policy: taxes versus spending. In J. R. Brown (Ed.). Tax Policy and the Economy, Vol. 24. Chicago: University of Chicago Press. doi: 10.3386/w15438. Alesina, A. & Ardagna, S. (2013). The design of fiscal adjustments. In J. R. Brown (Ed.). Tax Policy and the Economy, Vol. 27. Chicago: University of Chicago Press. doi: 10.3386/w18423. Barrios, S., Langedijk, S., & Pench, L. (2010). EU fiscal consolidation after the financial crisis. Lessons from past experiences. European Economy Economic Papers, 418. Bröthaler, J., & Getzner, M. (2015). The tax-spend debate and budgetary policy in Austria. International Advances in Economic Research, 21(3). doi: 10.1007/s11294-015-9532-1. Dráb, R., & Mihóková, L. (2011). Determinants of fiscal consolidation success in V4 countries. In R. Mirdala (Ed.). Financial aspects of recent trends in the global economy, Vol. II. Romania: ASERS Publishing. Engle, R. F., & Sheppard, K. (2001). Theoretical and empirical properties of dynamic conditional correlation multivariate GARCH. NBER Working Paper, 8554. doi: 10.3386/w8554. European Commission (2000). Public finances in EMU-2000. European Economy, 3. European Commission (2007). Public finances in EMU 2007. European Economy, 3. European Commission (2011). Tax reforms in EU member states 2011. Tax policy challenges for economic growth and fiscal sustainability. European Economy, 5. Eurostat. Statistics 2017. Retrieved form http://ec.europa.eu/eurostat/data/database. (10.10.2016). Guichard, S., Kennedy, M., Wurzel, E., & André, C. (2007) What promotes fiscal consolidation: OECD country experiences. Economic Department Working Paper, 553. Koopman, G. J., & Székely, I. P. (2009). Impact of the current economic and financial crisis on potential output. European Economy Occasional Papers, 49. Maltritz, D., & Wüste, S. (2015). Determinants of budget deficits in Europe: The role and relations of fiscal rules, fiscal councils, creative accounting and the Euro. Economic Modelling, 48. doi: 10.1016/j.econmod.2014.12.001. Mihóková, L., Harčariková, M., & Martinková, S. (2016). Changes in fiscal system of European member countries in the context of fiscal consolidation process (Part II). In M. Bezpartochnyi (Ed.). Organizational and economic mechanisms of development of the financial system: collective monograph. Riga: ISMA University. Molnar, M. (2012). Fiscal consolidation: part 5. What factors determine the success of consolidation efforts? OECD Economics Department Working Papers, 936. doi: 10.1787/5k9h28mzp57h-en. Mirdala, R. (2013). Lessons learned from tax vs. expenditures based fiscal consolidation in the European transition economies. Journal of Applied Economic Sciences, 8(1). Nickel, CH., Rother, P., & Zimmermann, L. (2010). Major public debt reduction: lessons from past, lessons for the future. ECB Working paper series, 1241. OECD (2007). Fiscal consolidation: lessons from past experiences. OECD Economic Outlook. Preliminary edition. Reinhart, C. M., & Rogoff, K. S. (2009). The aftermath of financial crises. NBER Working Paper Series, 14656. doi: 10.3386/w14656. Saraç, M., & Basar, R. (2014). The effect of informal economy on the European debt crisis. Siyaset, Ekonomi ve Yonetim Arastimalari Dergisi.